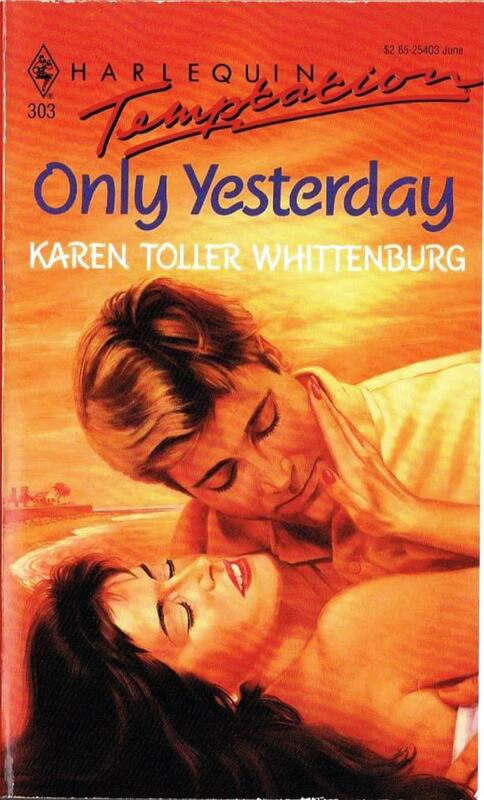 Only Yesterday is a Harlequin Temptation, from 1990, by Karen Toller Whittenburg. This is one of her earlier Harlequins. She started writing in 1981, took three years to get published, and became a Harlequin author in 1987. Whittenburg starts off with a fabulous meet. Merry is on a plane experiencing problems. As they come in for a crash landing, the stranger beside her takes her hand, and they introduce themselves. Lee was not there by chance, though. He’d been looking for her. That night, while staying at a hotel before continuing to their destination, and still shaken, they eat, then sleep (just sleep) together. It turns out they are traveling to the same resort town, and staying at the same hotel, thanks to a last minute arrangement on Lee’s part, and they spend another day together. Then Merry’s preschool daughter shows up, brought by the couple who were looking after her, as well as their own two children, and Lee gets involved in family beach outings. Merry’s friends are entirely supportive of her apparent new boyfriend, encouraging her to have a little fun after being a widow for three years. She’s interested in that too. While their relationship grows, the tension builds. When will he tell her that he’s tracked her down because he’s studying child stars, and she’s particularly interesting because she turned her back on fame and disappeared from the limelight? He makes a few attempts, but eventually she learns from someone else, and understandably feels deceived. Unfortunately, after the great meet and strong tension, the final third of the book is weaker. She’s back home and at work, so there are no more opportunities for romantic walks on the beach. He still wants to see her, she is still physically attracted to him, and so they sort it out. A subplot involving Merry’s relationship with her mother is also happily though unsatisfactorily resolved. The Temptation line was supposed to feature realistic, modern women, and Merry is more or less consistent with that. She works, and pays her own way on dates. However, her character growth is limited to learning that she was wrong about Lee, and wrong about her mother. That’ll teach her to be independent. As for Lee, he was just creepy. The plot makes it possible to forgive his initial stalking, but he continues with creepy behavior. When she learns about his research project, she asks that he not write about her, but he refuses – and she accepts that. Lee’s a PhD student, writing his dissertation, but he assures her that almost no one will read it, and he is not interested in using it for a book. Even in pre-internet 1990, dissertations still went into libraries, and what kind of PhD student does not plan to write about their research? I guess they did not have any ethics committees or privacy laws in 1990, either. Finally, in a characterization that allows the hero be to realistic and modern, and still be the wealthy benefactor, PhD student Lee has apparently unlimited finances thanks to a trust fund. So Lee’s not just creepy, I also had a lot of trouble believing him as a character. Fabulous opening, disappointing conclusion. We’ve all had dates like that, and sometimes it’s worth trying again. Whittenburg is still writing for Harlequin, so I might check one of her newer works to see what she’s doing now. Meanwhile, the bubble bath rating is dollar store vanilla.